Solid white nylon improved design machine cut new worms. Highest quality precision and uniformly cut from the solid nylon. 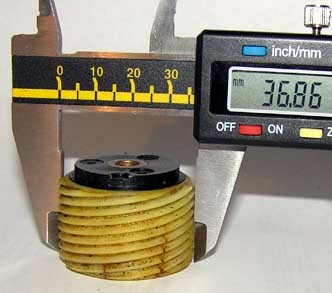 New worm gears manufactured to exact Bell & Howell thread dimensions. Uniformly made with an improved design neck and properly threaded grub screw holes. Stainless steel grub screws provided are longer and secure the worm tight on the drive shaft. Precisely bored 1/4" centre hole is an exact fit on the drive shaft. Includes stainless steel threaded grub screws. Immediate worldwide despatch. Excellent smooth surface quality from lathe turning. No helicoil inserts required and these are not old stock items. Requires no finishing or planishing. These are traditional gears and not 3-D printer copies made of droplets of molten plastic whose surface and interior quality resembles puffed wheat under magnification. Bell & Howell part number 2304782. Solid, machine-turned, nylon. British made to manufacturers' specifications. Will not crack up like the original ones. Repair your Bell & Howell 16mm projector now. Bound printed paper Service Manual and Parts List is included. Buy two or more new worms at a discount and restore Bell & Howell projectors for profit. New non-animation worm gear shown fitted to Bell & Howell 1695. New worm diameter 36.86mm. Worm gears on Bell & Howell projectors are prone to hairline cracks that develop into fractures that eventually cause sudden breaking up while the projector is running. Almost all Bell & Howell projectors now have cracked worms. 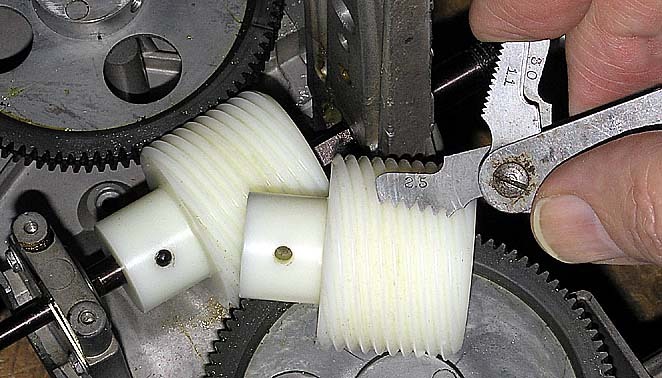 The 'animation' model Bell & Howells, known as "Specialist" have a worm gear that consists of a thin outer nylon shell with a helical 'archimedean' worm gear that drives the sprockets. Replacement requires a major strip-down of the projector to replace the broken worm, usually with a solid, non-animation one. Below: Original worm thread pitch of 2.5mm measured on old worm. Cracked animation worm gear from a Bell & Howell model 1695.
such speed. It seemed like they were right here the very next day! way to the scrap heap, just because of this issue. come up with a decent resolution. 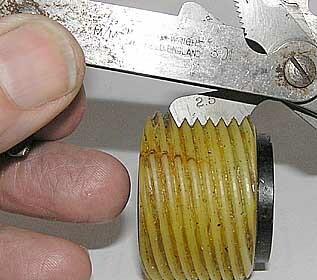 Here is an an example of an original nylon 'animation' worm gear shown in a Bell & Howell model 2592. It is rare to find an original worm, as shown in this example, that remains uncracked and intact. As can be seen in the photograph below, a catastrophic break has developed from a crack in the thin outer shell. Typical broken worm (arrowed). The two large sprocket wheels mounted above and below, are made of an alloy centre with nylon gear teeth on the outer. Because they have been affected by the cracked worm prior to failure of the old worm, they may require careful filing of the teeth sides where the crack has scored into them.Also they can become 'out of round' with a bulge because the path of the crack acting to wear the sprocket teeth. The sprocket teeth may require 'topping' to stop binding in positions. 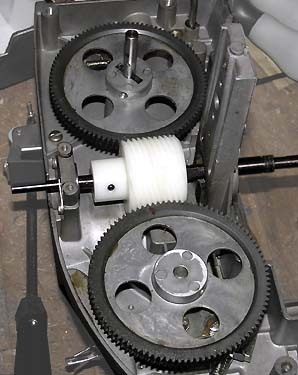 The top sprocket wheel is the one found to bind more than the lower one. Filing nylon will require a fairly coarse needle file and requires an oblique stroke at the sides of the sprocket gear teeth that are binding and no side shake is found. It is sensible to 'run-in' the worm gear mechanism on the bench to be sure that the worm gears are freely running before reassembling. In the Bell & Howell repair manual provided there are is a diagram plan to make a home-made motorised jig for setting up, adjusting, and running in the mechanism before fitting back in the projector. The cracked worm may cause the large sprocket gear teeth to bind in positions under test. There should be slight 'side shake' felt at all positions as you grasp the large (nylon outer) gear wheels that engage with the worm. You may need to apply a coarse needle file to the large gear wheel teeth profiles with an oblique stroke at the positions where there is binding, or no side shake is felt. When the projector is running with the lamp on, the gears will expand due to heat, so it is necessary to allow sufficient clearance to avoid binding or uneven running. New Bell & Howell projectors stored for many years in a government warehouse unused were all found to have cracked worm gears. This indicates that the problem was not incorrect lubricant or missuse. There is evidence that some Bell & Howell projector worm gears with diverse hairline fissures (that do not join together) can be run regularly without catastrophic failure. However it is only a matter of time before an original worm gear will inevitably fail. A Bell & Howell projector that has had a replacement solid worm fitted is to be preferred. www.ian-partridge.com ~ Web page content photography and design ~ Copyright ©2011 ~2019 Ian Partridge.